Beyond Boundaries will help you: Reinstate closeness appropriately with someone who broke your trust Discern when true change has occurred Reestablish appropriate connections in strained relationships Create a safe environment that helps you trust Restore former relationships to a healthy dynamic Learn to engage and be vulnerable in a new relationship as well You can move past relational pain to trust again. Beyond Boundaries will show you how. 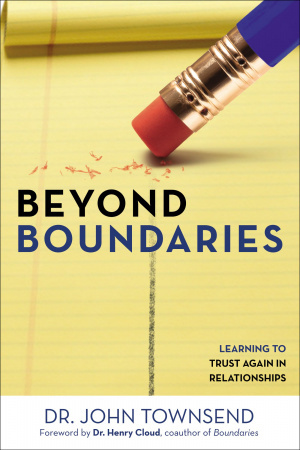 Beyond Boundaries by John Townsend was published by Zondervan in November 2012 and is our 23801st best seller. The ISBN for Beyond Boundaries is 9780310330769. Be the first to review Beyond Boundaries! Got a question? No problem! Just click here to ask us about Beyond Boundaries.